The cinematic odyssey of Ip Man — the real-life master of Wing Chun and, famously, instructor of Bruce Lee — continues with “Master Z: Ip Man Legacy.” But don’t expect Donnie Yen to show up in this installment and don’t expect much in the way of historical fealty, narrative plausibility or serious examinations about human dignity or the ethics of kung fu. Expect, instead, a spin-off about Ip Man’s rival from “Ip Man 3,” Cheung Tin Chi (Zhang Jin, “Pacific Rim: Uprising”). After his secret defeat at the hands of Ip Man, Cheung Tin Chi became a mercenary — so briefly that it barely impacts the story. After retiring, he sets up a tiny grocery and tries to raise his son in peace, but a chance encounter with opium dealers leads to one giant fight sequence after another. The story of “Master Z” is frustratingly muddled, and Cheung Tin Chi has very little to do with it. He runs afoul of a criminal named Tso Sai Kit (Kevin Cheng, “Badges of Fury”), who exacts his revenge by burning his grocery store down. But then our hero takes up with the owners of a local tavern, which happens to have be patronized by Tso Sai Kit’s sister, Tso Ngan Kwan (Michelle Yeoh), who is also a major crime boss who’s trying to go straight. 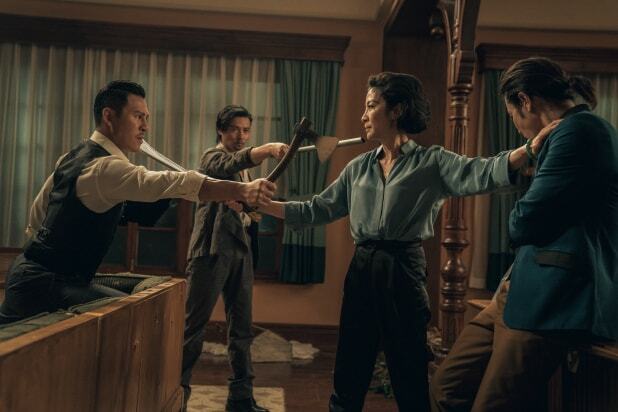 “Master Z” comes from director Yuen Woo Ping, and it’s nothing short of an action-movie-lover’s delight to see him working with Michelle Yeoh again, in a movie about Wing Chun no less. Yeoh only gets one proper fight in “Master Z” (unless you count beating someone to death with an abacus), but it’s a good one, and it ends beautifully. In many respects “Master Z” is a beautiful production. The art direction by Raymond Chan (“The Mermaid”) brings the neon streets of Hong Kong to attractive life, with cascading rows of giant signage that are quickly utilized for high-flying stunts and imaginative choreography. The whole film looks just a little fake, but in that Technicolor MGM-musical way that feels like a warm blanket. But following the three “Ip Man” movies with “Master Z” is a bit like following the first three “Rocky” movies with “The Fast and the Furious.” If you squint you can see a few thematic connections, but it’s a broad departure from the tone of the rest of the series. Wilson Yip’s films were (at best) loose historical fiction and had their fair share of over-the-top fight sequences, and yet their earnestness was unmistakable. They were broad dramatizations of key cultural moments, in which caretakers of Chinese martial arts found their livelihoods, their art and their dignity challenged by oppressors of all kinds. Overcoming those adversities was rousing and pure. “Master Z” is pretty much just a pulpy crime movie, and although it’s not a bad one, it can’t help but comes across as rather adolescent compared to those other entries. It’s got characters so arch they cook steaks for everyone they kill, and then get bummed out when they die before they can eat them. It’s got a little kid practically praying over a knockoff Batman music box (sorry, “Black Bat”) for his father to beat up the bad guys. And just when you think the movie will address some of the broad systemic issues it brings into the mix, like a wildly corrupt police force that shirks the law in front of crowds, the film cops out with, essentially, a mega-happy ending. Frankly, big chunks of “Master Z: The Legacy of Ip Man” are so broad they’re almost goofy. The fights make up for it, and the great ensemble makes this broad world semi-believable. It’s a step down for the “Ip Man” series, but it’s still within punching distance, so don’t take your eyes off it. It’ll get you.